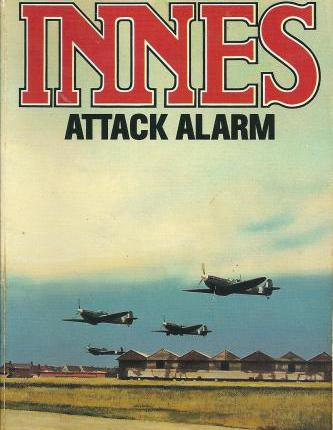 Attack Alarm is an espionage novel written by author Hammond Innes, who was stationed at Kenley as an anti-aircraft gunner during the Battle of Britain. Not a great deal is known about Innes’s service in the Royal Artillery between 1940-1946, but his book written and published during the war offers an invaluable and detailed account based on his time at Kenley, most notably the devastating attack on 18 August 1940, Kenley’s Hardest Day. Hammond Innes was born further south from Kenley, in Horsham, Sussex, in 1913. He began his career as a journalist writing for the Financial Times, with his first novel The Doppelganger being published in 1937. He later gained further notoriety when many of his books were turned into films, perhaps most famously, the Wreck of the Mary Deare in 1959, which starred Charles Heston and Gary Cooper. Innes had a tendency for adventure, and from as early as his first books, hints of conspiracy and anti-establishment plots have always served as an undercurrent to his adventure thrillers. He was also known for his compulsion to write from personal experience, depicting candid, vivid scenes from memory; the attack he endured at Kenley during the blitz no doubt left an indelible mark, inspiring him to write Attack Alarm whilst still serving in the war. Attack Alarm is a wartime thriller that largely concerns itself with an espionage theme set on a fictional airfield called Thorby; there is no doubt that this airfield is entirely based on RAF Kenley, and that the book’s protagonist Barry Hanson, is in fact, Hammond Innes himself. The book begins with a dedication to Innes’s wife, Dorothy, in which he not only outlines how much of himself he has put into the book, but how ‘within the framework of a thriller’ he endeavoured to ‘give some idea of the atmosphere of a fighter station during the Blitz’. ‘The atmosphere of the place was stifling. The air was hot and full of smoke, and the lamps, which had just been lit, glowed dimly…This was Thorby in mid-August’. Although the book follows a fictional story of a German spy who has infiltrated Thorby in order to gain secrets for the Nazi’s eventual land invasion, we are privy to a detailed first-hand account of what it must have been like to serve at Kenley during the bombing. Innes captures the tension vividly, describing the incoming sound of the Luftwaffe as a sound that grew louder until it was a ‘dull throb’, like the ‘beat of blood against one’s eardrums’. The soldiers based at Thorby witness an attack on a neighbouring airfield, Mitchet – which could easily be Croydon or Biggin Hill, who are able to hear and feel the bombing as ‘dull, heavy crumps, that seemed to make the earth quiver beneath your feet’. There is a constant unease about the base whilst the detachment wait for the Luftwaffe, or as Innes bluntly puts it, ‘waiting for their turn’. The apprehension is embodied by the nervous paranoia of the soldiers, where the lighting of a cigarette is frowned upon for fear of revealing yourself to the enemy, and the glimmer of a car’s headlights approaching the runway enough to trigger an alert. Innes also takes great pains to recollect the constant fatigue from the manning of the guns, working in ‘two-hour shifts’ in case of a ‘surprise attack’; three and a half hours being the longest amount of sleep one could expect while serving in the Artillery during this time. But despite all this trepidation, Innes is able to insert moments of comic relief through the camaraderie of the servicemen. “All right. But they’d better be careful. I ain’t in no hurry to go to Heaven”, chimes Mickey in response to a cigarette being lit, the young cockney gunner whose dialect is perfectly represented as a contrast to his superiors in the group. In between manning the guns, the squadron also enjoy a brief respite drinking ale in the big Naafi tent, just like so many at Kenley would have done so, singing songs about the ‘last war’ in quintessential British fashion. The plot unfolds when the downing of a German Dornier plane reveals suspicions of a secret Nazi invasion. This is where Innes reminds us that he is writing a fictional novel, breaking the realism by indulging in fantastical adventure, with a protracted story about a fifth columnist librarian working at the airfield. However, the expressive descriptions of bombers, dogfights, cascading explosions continue throughout the book, proving that Innes’s first-hand experience is genuine. 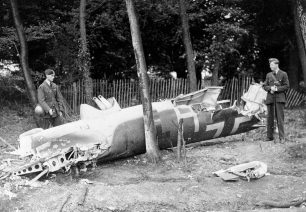 One particular eloquent moment stands out in chapter two, where he describes the delayed sound of the Dornier crashing as ‘supernatural’ after first witnessing it hit the ground, as though it had ‘spoken’ after it was dead. He compassionately portrays the crumpled wreck as a stark reminder of the humane futility of war, where it had once been ‘proudly flying through the night sky’. Its transformation from a ‘beautiful deadly weapon’ into an ‘ugly mess’ was entirely down to them. Kenley lost all ten hangars and twelve aircraft in the attack, which Innes documents with colourful narration in chapter 6: ‘My ears were singing, but I no longer braced myself involuntarily before each shot’ Innes recollects, becoming familiar to the carnage around him. His body reacted automatically, as he watched ‘silvery eggs’ dropping from the bombers as the red tracer shells of the Bofors ‘streamed lazily up’ to meet them like ‘little flaming oranges’. Attack Alarm’s significance is not only down to its fine detail of the attack on Kenley, but also because it shows us how pivotal Kenley and other RAF stations were in the war effort. The bravery and sacrifice by the RAF were instrumental in stopping a land invasion and winning the Battle of Britain. Innes’s service and book are a testament to that effort. There isn’t a lot of information available on Hammond Innes, and apart from his recollections in Attack Alarm, his time at Kenley remains largely an enigma. He seems to be one of those authors that have faded into slight obscurity, perhaps due to his old fashioned and occasional lumpen style; there are times in the book where his attempts to interject the story with moments of romance appear somewhat misplaced and over-sentimental, but, nonetheless, the circumstances in which the book was written are enough to excuse anything. Hammond Innes is best remembered for his detailed depictions, just like those in Attack Alarm, which were primarily of his own personal experience. We are all incredibly indebted to him for not only his service in the Battle of Britain, but for his evocative portrayal of his own personal experience at RAF Kenley in Attack Alarm. the borough. Many on Kenley Common as one would expect. But I recall the map also gave the location of Anti aircraft guns dotted around the area. There was one hidden in the valley of Welcomes Road which would have provided some cover. In the Press - "The Hardest Day"